A spa quality facial peel without damaging acids or abrasive polishing agents. 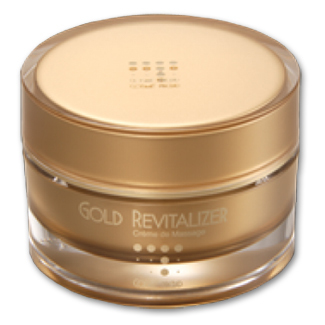 Gold Revitalizer, sloughs off old, dead skin cells revealing fresh, smooth skin. This unique product features the special ingredient of a natural 24K Gold ion formula to penetrate, exfoliate and moisturize the deepest layers of the dermis. Unlike peels that use acids or grains, Gold ion formula will not damage the skin. After the old skin is exfoliated, other active elements such as Vitamin E, Aloe, Collagen, Squalene Oil, Hyaluronic Acid, Sage, Pearl extract, Allantoin, DNA, Licorice, Bifidobacterium, Scutellariae Radix extract and Lumiskin provide a powerful combination that promote skin firmness, elasticity, moisture retention and skin-brightening. For optimal results use Gold Revitalizer at least two to three times per week, but is gentle enough to be used daily if preferred. Recommended for all skin types. 1. After cleansing the face, spread Gold Revitalizer evenly over the skin. 2. Using your fingertips, lightly massage the face until the Gold Revitalizer disappears. 3. Allow the face to dry for 30-60 seconds. 4. Massage the face again. When old skin cells start to come off, rinse away with cool or tepid water. 5. Follow with Gold Amber Rich Lotion.